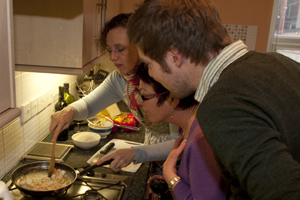 If you love Spanish food why not come to one of my cooking workshops? I run them on Saturdays from 12.00pm to 2.00pm (approximate end time) and the price is £30*. The workshops are given in English so no knowledge of Spanish is necessary; however, there is a chance to practice your Spanish over the meal if you fancy. If everybody at the workshop speaks Spanish, I will run the workshop in Spanish. Gift vouchers available. I run all workshops in my large, bright kitchen. They are informal, relaxed and a lot of fun — and of course the highlight is savouring our wonderful food with a glass of Rioja (or two)! Dates for 2018/19: Give me a ring or drop me a line and we’ll set something up! Summer workshops include gazpacho (described by one student as ‘sunshine in a cup’), tortilla de patata and gambas al ajillo, among other tasty treats! These workshop menus are popular from about April, but I can always put one on during the winter to bring in some sunshine to our cold winter days! Just give me a ring or drop me a line. I designed this workshop, first held on 30 August 2014, for a couple who loves outdoor Spanish cooking: paella, tortilla (potato omelette) and chorizo en sidra (chorizo in cider). I bought delicious organic chorizo and Asturian natural cider from El Colmado on Gloucester Road. Let me know if you’d like me to run it again. Pulses and pulse dishes are very popular in Spain. I will teach how to make bean and pulse stews, both vegetarian and non-vegetarian. There are countless soup and stew recipes: each region has its own speciality, as does each village and indeed each household! They are incredibly simple to make, and are nutritious and hearty — perfect for a cold winter’s day! Do you know the three secrets for making a perfect paella…? At this workshop, you’ll lean how to make a delicious seafood paella using ingredients readily available in your local supermarket. Impress family and friends – it’s surprisingly easy! And, once you learn the secrets of making a perfect paella, you can use your own creativity at home to cook wonderful paellas of all types using more elaborate ingredients. I begin the workshops by giving a brief history into the dish. Then, I show you how to make the paella, step by step. No need to write anything down as you will get a recipe card to take away with you. You will also get a sachet of paella seasoning and another of saffron.